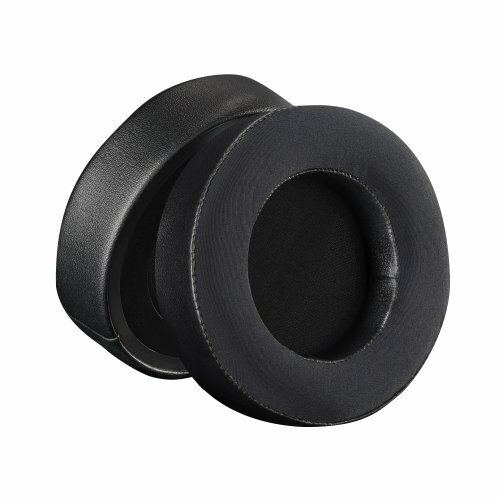 【GREAT APPEARANCE】 CE / FCC / ROHS certification is complete, Fit the game theme, made by the most popular skin-friendly rubber paint, which makes it durable for long-time use. 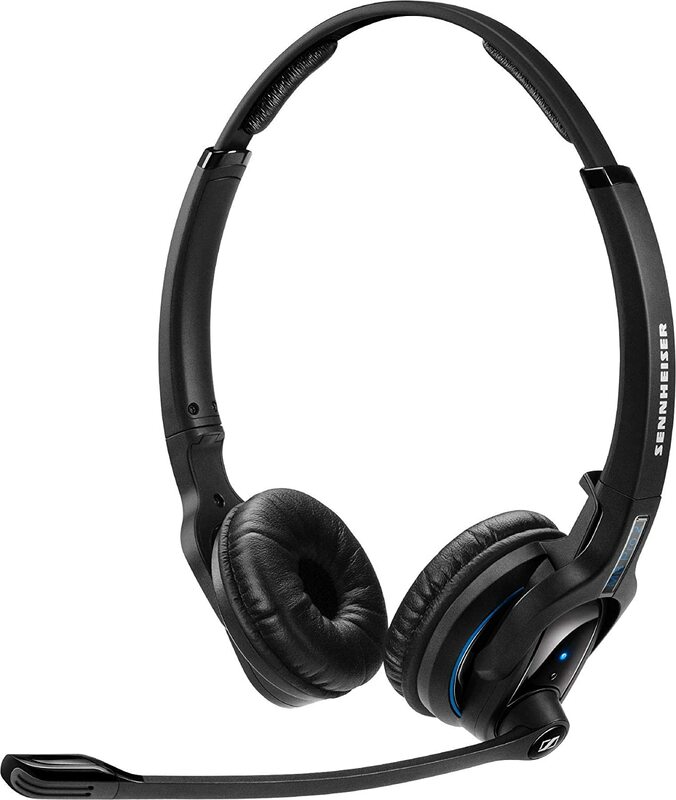 Great touch feeling, high sensitivity and noise reduction. 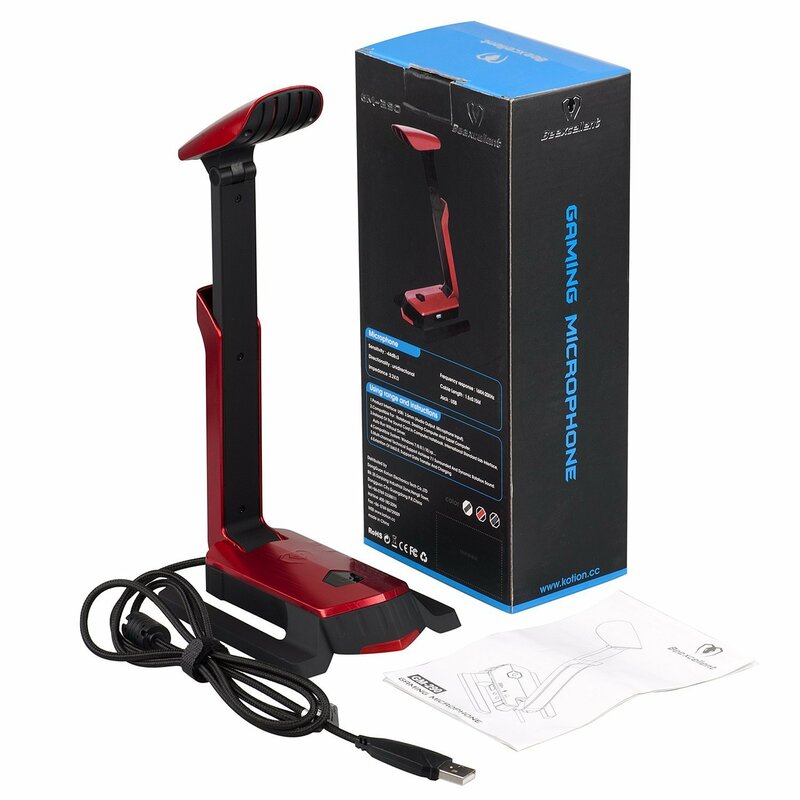 Easy to using the head of microphone up and down rotation. 【MUILTIFUNCTIONAL】 Use for Chatting, Gaming, Meeting, Listening music, Podcast, Recording video on Twitch, Youtube. 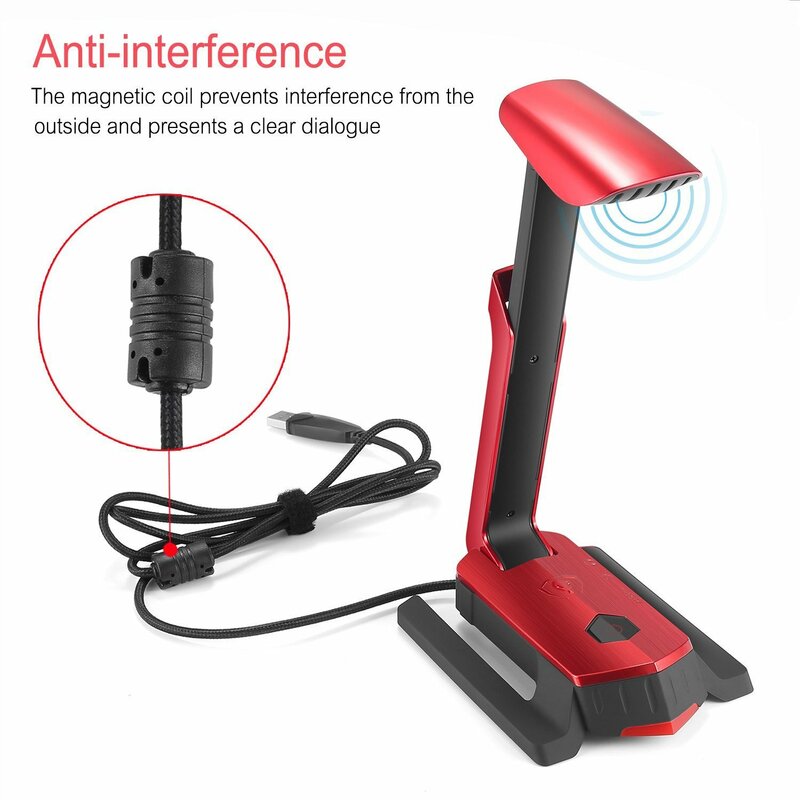 It also can be used for cell phone charge and USB transmit data. 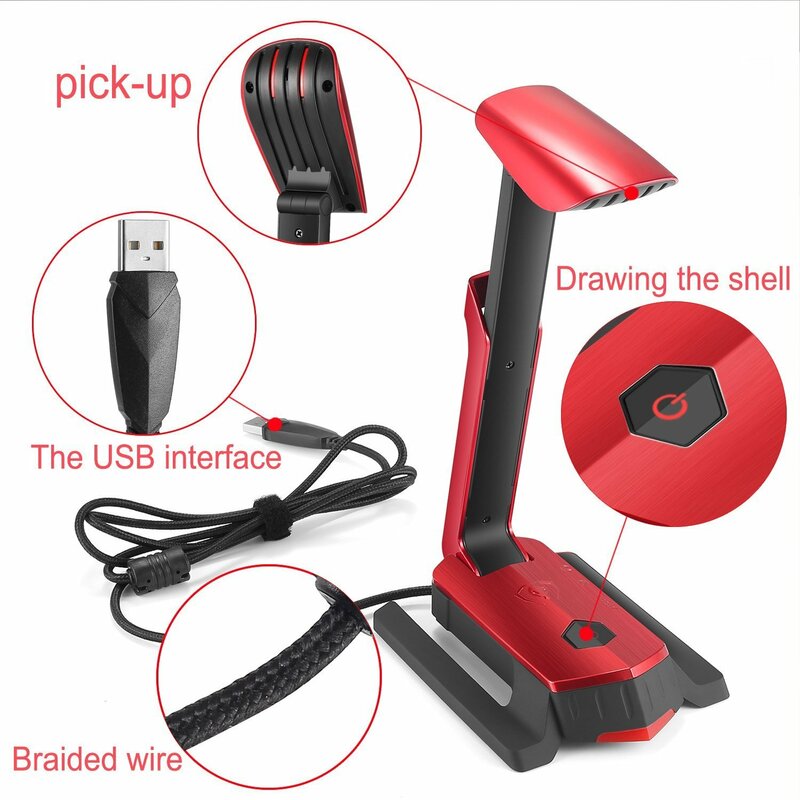 For example Flash card reader etc. 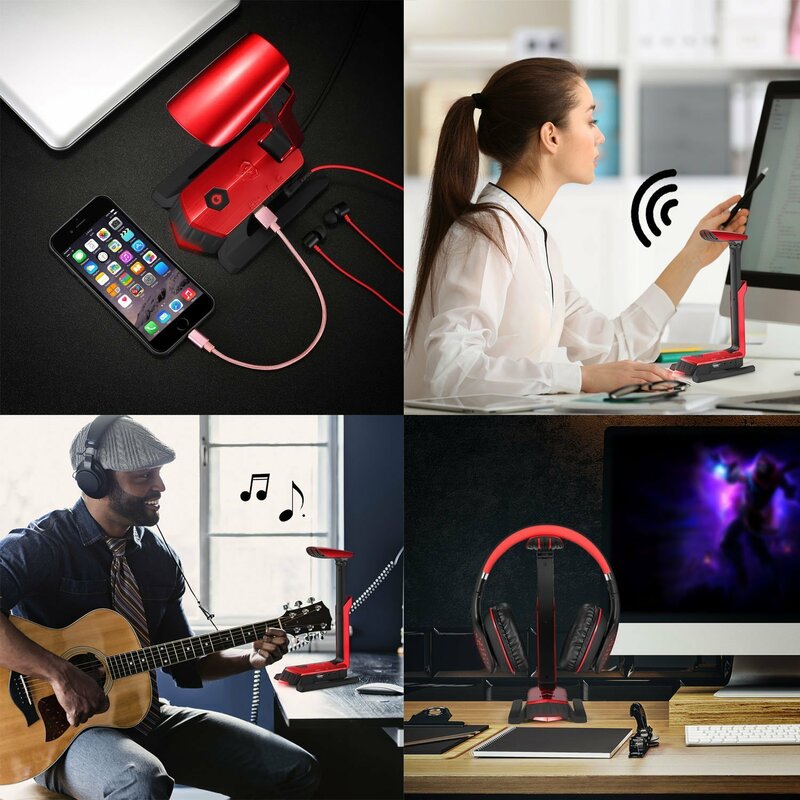 【BUILT-IN 7.1 STEREO SURROUND SOUND】Plug in this microphone, connect your normal headphones, to be a 7.1 stereo surround sound headset without any other budget. Share music and games, PS4, Xbox one, Implement more dynamic sound effects, dynamic environment rotating sound field, experience shock and sound effect. 4. 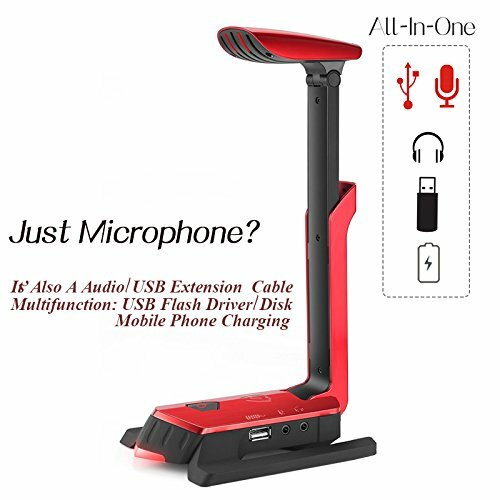 【NO DRIVER NEEDING】 Simply plug in the microphone and it works, USB microphone offers excellent sound quality for any plug-and-play enabled PC desktop laptop for recording your music or podcasting, no software or app downloaded required. 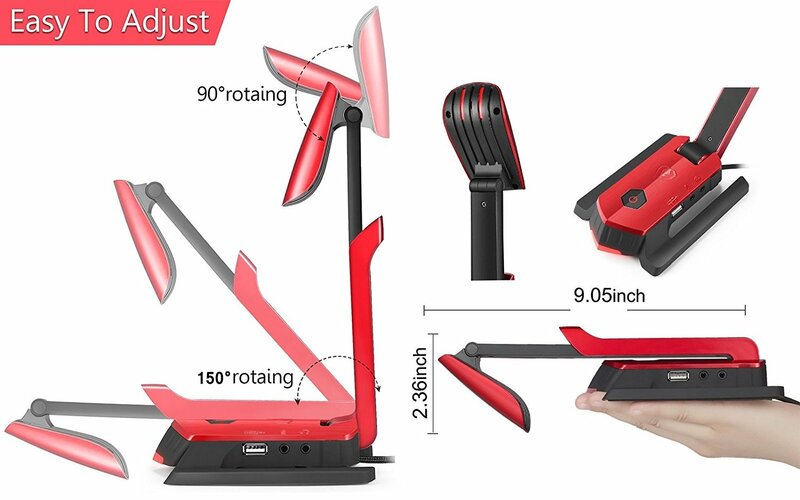 The microphone head has an advantage of rotating 90 degrees and the microphone holder also can rotate 180 degrees. 【MULTIPLE APPLICATION]】Fit with studio, Gaming, Meeting, Chatting, Podcast, Skype, Recording video. 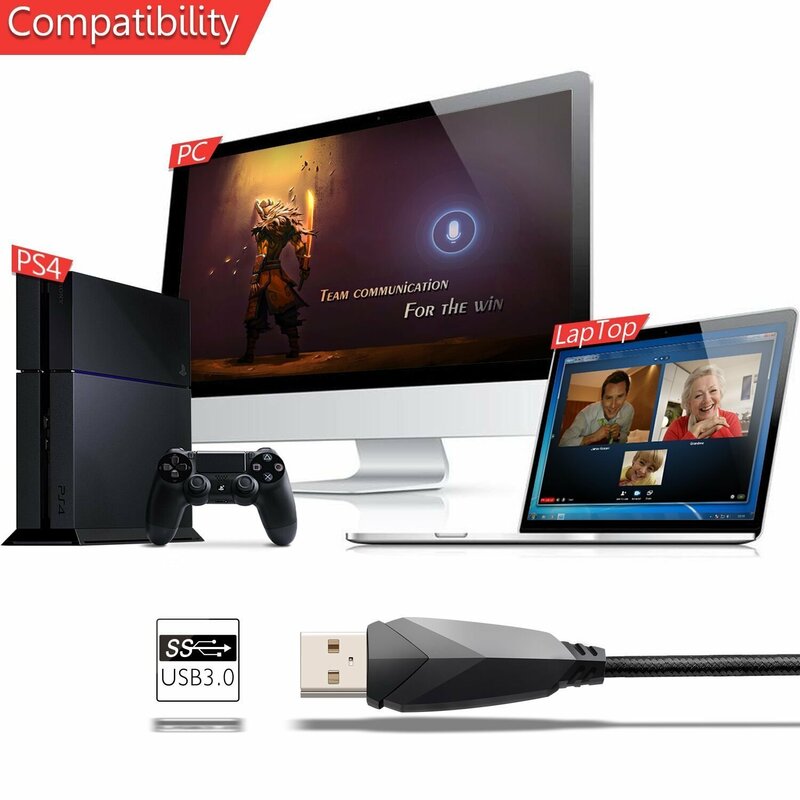 Compatible with most computer, laptop, desktop, PS4. This microphone does an excellent job at a very reasonable price. The recordings that it generates have a clear, natural sound with good background noise suppression. The installing was simple, Plug and Play pretty much. The black and red goes with my black and red color setup and the little red LED lights are a decent addition. 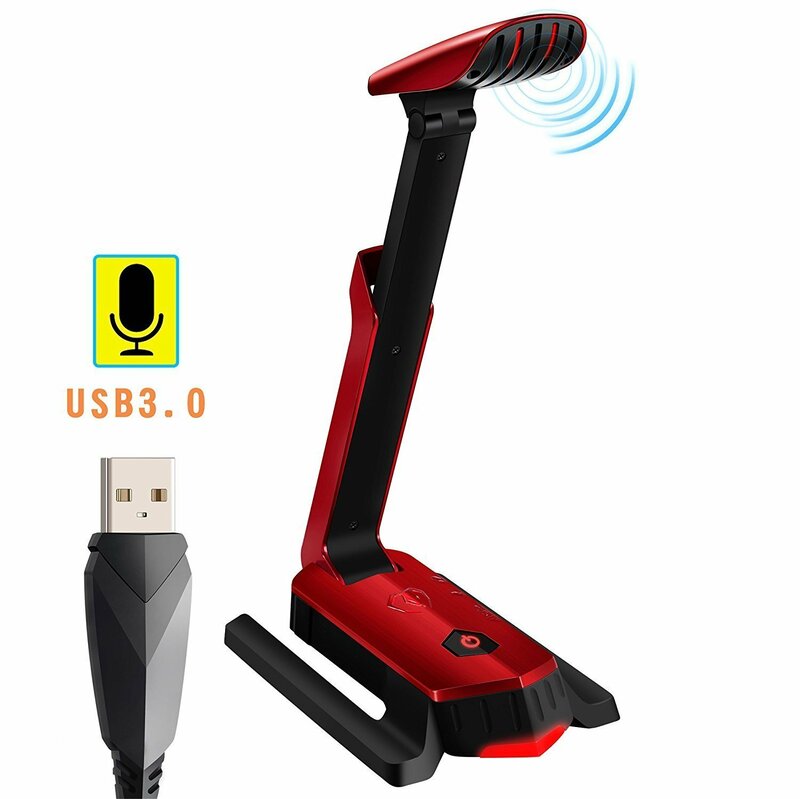 I have used this gaming mic couple time with my friend for LOL, “voice quality is not bad” feedback from one of my friends, compared to the price, I think it worth to buy one like that. Nice microphone. 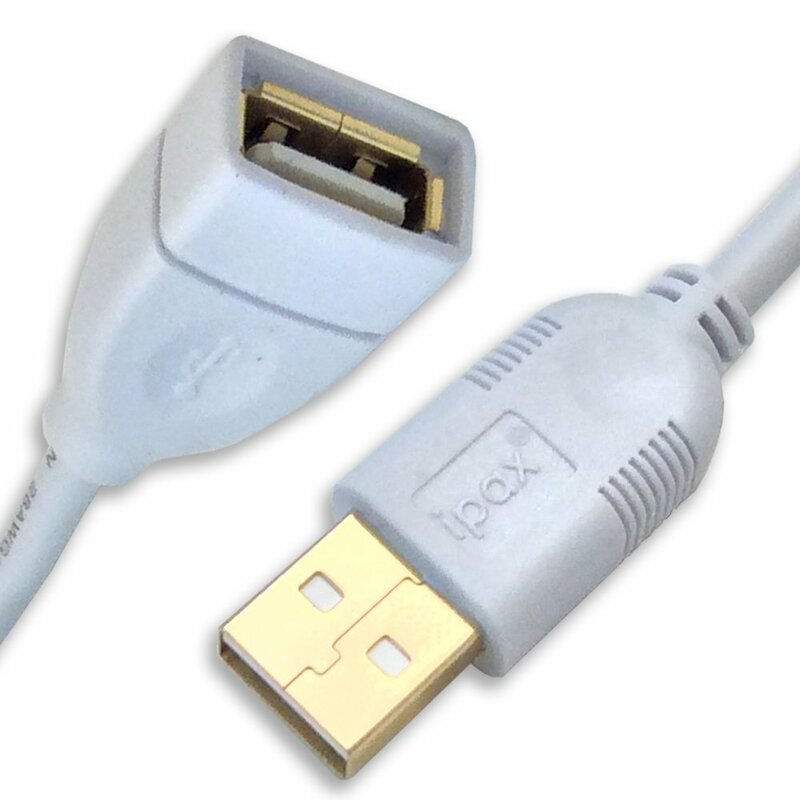 Usb connector and a voice switch. Voice is good and clear. This mic is perfect for pc gamers using systems like Discord to chat with friends in. Especially if you don't like wearing headset/mic combos. For the price point, it works and sounds great and honestly, I wouldn't suggest any other mic unless you were maybe wanting to stream professionally. First off, this review is for the external mic, not the headset. The original listing for this mic (which I bought) disappeared, so this probably won't show up as verified, but I'd still like to share my experience with others. The mic is very bad. With no drivers, there are no windows enhancement options. There is a ton of fuzz and interference when I use it despite whatever I do. It's not to the point where you can't hear anything, but it is still really bad. I get better audio from my phone microphone (yes, I've actually tested it!) Now, the mic does have a usb port and a headphone/mic port, so those are the pros, but the headphone port has quite a bit of static itself. Would not recommend to anyone. I bought this mic for chatting with my friends when we play LoL together. My friend told me the voice is clear and with no background noise, so I believe it is good enough for just communicating with others. It has a USB interface and a earphone jack on it so that I can use it to charge my iPhone. 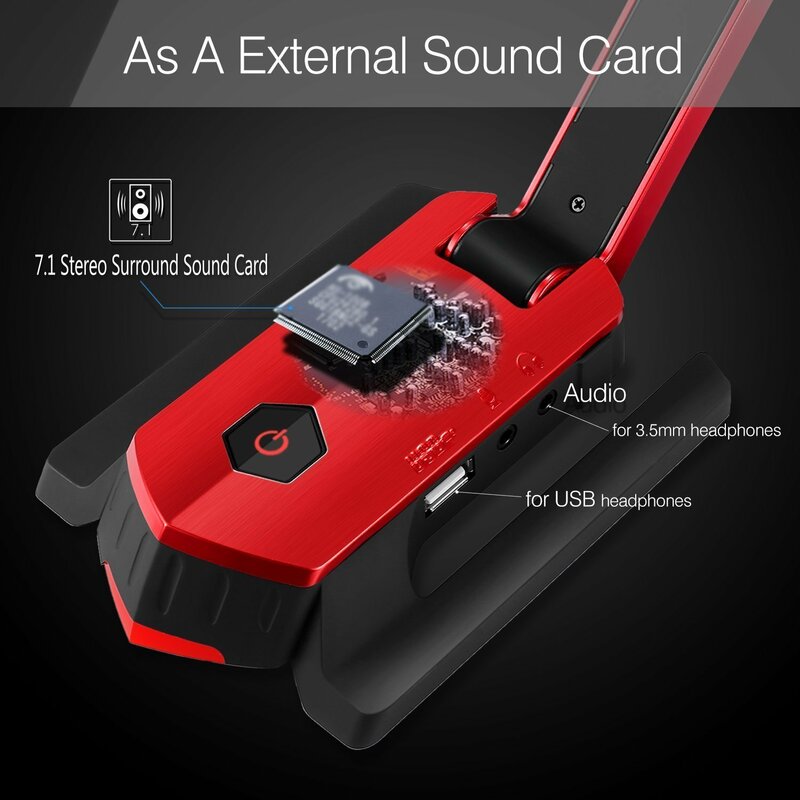 And once I connect my headphone, the Bluetooth speak will be disconnected, which is convinient.